Lithuania takes a step towards legalizing the ritual slaughter of livestock for food after neighboring Poland imposed a ban. Lithuania on Tuesday took a step towards legalizing the ritual slaughter of livestock for food, seeking to expand its exports after neighboring Poland imposed a ban. "Arab countries and Israel represent new opportunities for meat exporters," lawmaker Vytautas Gapsys, who tabled the draft legislation, told parliament, according to AFP. In the first reading, 51 lawmakers in the 141-seat parliament voted in favor of legalization and two against, with seven abstentions. According to EU law, animals in Lithuania and other member countries must be stunned before slaughter. 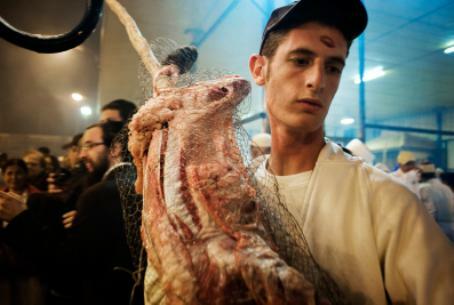 Kosher and halal slaughter require that an animal be killed by slitting its throat without first being stunned. Two more parliamentary votes and a presidential signature are needed to approve the law that would exempt religious communities from the requirement, reported AFP. Lithuania's tiny Jewish community on Tuesday welcomed the move. "We would be pleased if the law is adopted. It could encourage exports and would also be important for the local community," community leader Faina Kukliansky told AFP. The Jewish and Muslim communities each number around 3,000 people in the Baltic nation of three million people, which joined the European Union and NATO in 2004 and currently holds the rotating EU presidency. Ritual slaughter was banned in EU neighbor Poland on January 1 after its Constitutional Court deemed it incompatible with animal rights legislation. Then on July 12, lawmakers struck down a government bill that would have reinstated the practice, spurring cheers from animal rights activists and criticism from religious leaders and commercial butchers. Polish farmers and exporters of meat to Israel and Muslim countries exported up to 350 million euros ($460 million) worth of kosher and halal meat a year before the ban. Following the Polish slaughter ban, Israel summoned the Polish ambassador to register a formal protest against the ban, while Knesset Speaker Yuli Edelstein sent a letter of protest to his Polish counterpart over the ban. Poland's Muslim community has noted that the ban on halal and kosher slaughter is invalid under European law.